Art or Design? - Archpaper.com Art or Design? When the world thinks about Chicago’s storied design legacy, the topic usually turns to architecture and urban planning. CHGO DSGN, an impressive survey of local design output on display through November 2 at the Chicago Cultural Center, wants us to recognize the equally important global influence its design professionals have had on graphic arts and the furnishings and housewares industries—both historically and right now. It shouldn’t be surprising that the show seems heavy on printed materials, given the background of its curator. Valicenti’s firm, Thirst, has been one of the nation’s leading graphic design studios for decades. But it’s also because of printed matter’s sheer ubiquity. Despite years of handwringing over the death of print, typography is still everywhere—particularly, now, on the Internet. The examples on display reference the great Chicago type designers of the early 20th century, illustrating a tradition that’s clearly endured into the 21st. An astonishing variety of typographic materials makes up a substantial portion of the show. A large table at one end of the gallery features scores of books, magazines, brochures, exhibition and auction catalogs that visitors are encouraged to peruse. But there’s also ample evidence that type plays an important part in all kinds of digital and electronic media. The many examples of furnishings—both residential and office/institutional—and housewares reflect the city’s long history as a wholesale marketplace for these items. It’s great to see a length of beaded paper recognizing Maya Romanoff, the influential designer of wall coverings who died last year, and equally satisfying for the number of works by rising stars: lighting fixtures and serving pieces by Steven Haulenbeek, seating by Jonathan Nesci, and glassware by Felicia Ferrone. 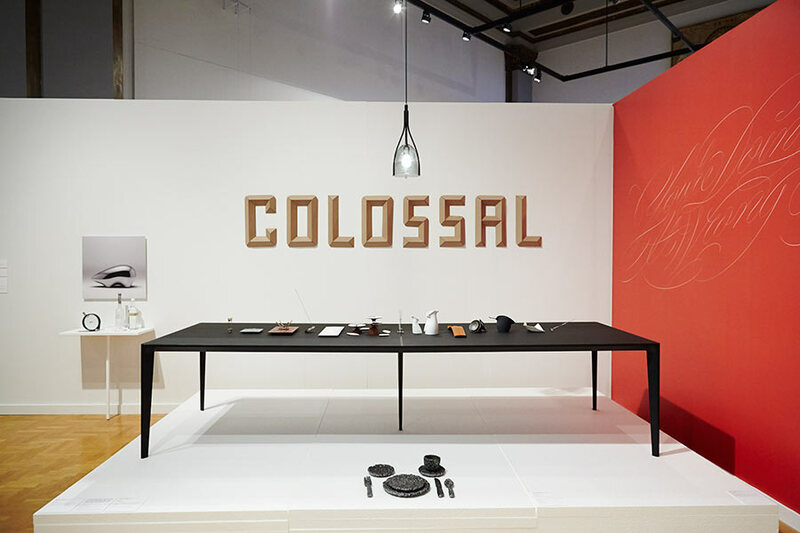 It’s probably no coincidence that both Nesci and Ferrone have had solo exhibitions at Chicago’s Volume Gallery, one of the few commercial exhibition spaces in the country specializing in design objects. Each creates work that appeals to collectors with their distinctly cerebral qualities which often transcend functionality, and occasionally defy it. 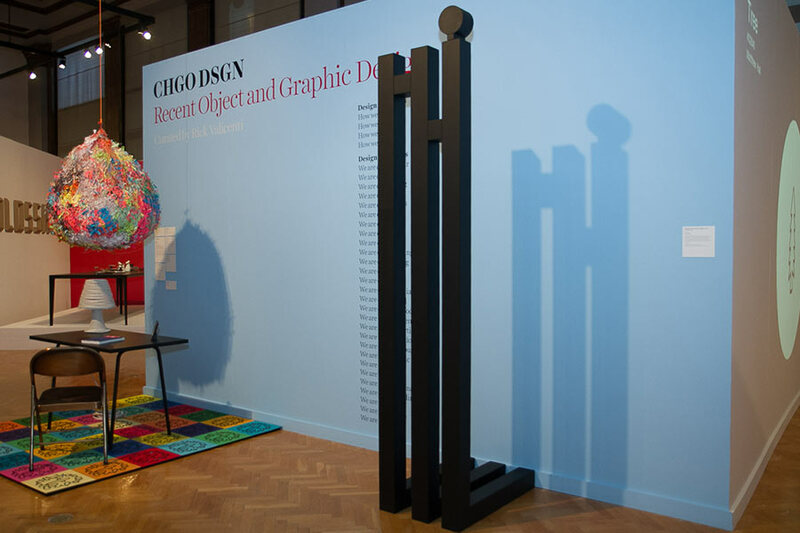 Whether intentionally or not, CHGO DSGN effectively fuels the ongoing debate about the relationship and distinction between “art” and “design.” If art exists on a more esoteric plane than utilitarian design, one could still argue that nearly everything in this show—while functional and of some obvious utility—similarly stands as a work of art. Considered in terms of contemporary art movements, the emphasis on type and text, which dominates the show’s mix, makes good sense. Text-based art dates back to the Dada period, at least, but it reached a sort of climax in the late 20th century, with work from like Jenny Holzer, Barbara Kruger, Bruce Nauman, and Ed Ruscha. Jackson Cavanaugh’s contribution to the show might be the consummate expression of conceptual typography in that tradition. What appears to be a wall-scaled work of elegant Spencerian hand calligraphy reading “You’re doing it wrong” is actually a super-sized sample of a face Cavanaugh designed for his Okay Type foundry, called “Doing It Wrong.” It’s his wry observation about the disappearance of cursive writing. Maybe creating it with a typeface is wrong, but if no one can do it by hand anymore, how else will it survive? Valicenti worked on the installation design with School of the Art Institute of Chicago professor Tim Parsons. He ends his introductory statement about the show—laid out in large type above the entry to the gallery space—with a plaintive “I wish this room were bigger.” Composed of artful juxtapositions of objects in multiple vignettes, CHGO DSGN is extremely satisfying. And indeed, while the show is teeming with the riches of design the city churns out, its curators clearly could have filled a much larger space.